While flipping back through Richard Holmes's great book Falling Upwards, I reread his short description of a speculative machine—an almost-invention—by Benjamin Franklin. 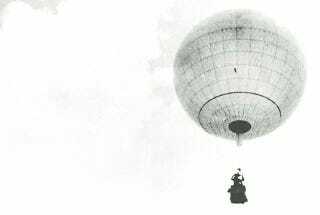 The Founding Father, electrical experimenter, and prolific inventor came up with something Holmes describes a "patent balloon icebox," a refrigerator in the sky. "People will keep such Globes anchored in the Air," Holmes quotes Franklin as writing, "to which by Pullies they may draw up Game to be preserved in the Cool, & Water to be frozen when Ice is wanted." That we might anchor our appliances up above us in some undefined aerial territory, to access or use when needed, conjures up visions of some reserve-world of non-electrical devices hovering over us in the sky, an unearthly archive, a storage facility set loose in the weather and clouds, but for some helpful rope we can tug on to bring things down to earth again. As if we could we break up architecture into floating pieces, with specific functions and needs, sending whole rooms—kitchens, entertainment complexes—up into the air on balloons, forming weird constellations of domesticity we might forget about for days at a time. A cloud passes and the sun goes dark—but you look up to see tonight's dinner floating by on a quiet spring wind, instead. Irrelevant image courtesy of the U.S. Army Balloon Signal Corps.